Special features: The Heath Fritillary is one of the most endangered butterflies in the UK. Their flight is weak and fluttery, and their range is small, so they usually remain in one place.&nbnsp;Consequently when their habitat disappears so does their colony. Heath Fritillaries have orange and black chequered wings. 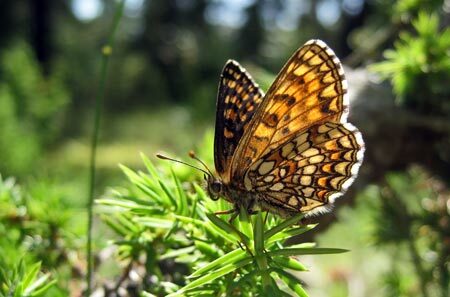 They can be distinguished from other fritillary species because they have no spots or pearly markings. The larvae are black with tiny white spots. Each body segment has a band of pale orange coloured spikes.